Instagram is currently one of the most popular social platforms in the US, with roughly a billion active viewers monthly. Since 83% of marketers find it useful to include social media in their strategy, reaching your target audience through Instagram is a great idea. User-friendly and simple, managing an account is easy, but sometimes you might need some inspiration for posting the right content or giving your feed a refresh. So, what should you post on Instagram? Instagram is a great opportunity to network with other small businesses and reposting*, or “regramming,” will build that network. Much like sharing or retweeting, reposting will connect you with a broader audience. Small businesses can engage the local community better when networking with other local businesses. Of course, you want to check the sources of these regrams; try reposting images from companies with a similar audience, or maybe post about community events and happenings that would be compelling to local viewers. You can even regram* a viewer’s post! Reposting consumer’s posts about your products is a great opportunity to connect with your target audience more genuinely. Seeing a user’s real experience of your product builds trust and establishes legitimacy. Also, it’s nice to reach out to your faithful followers. The image above shows a repost by Sun and Ski Inn (@sunandskiinn), located in scenic Stowe, VT. This image was originally posted by the photography account Stowe Beautiful (@stowebeautiful). 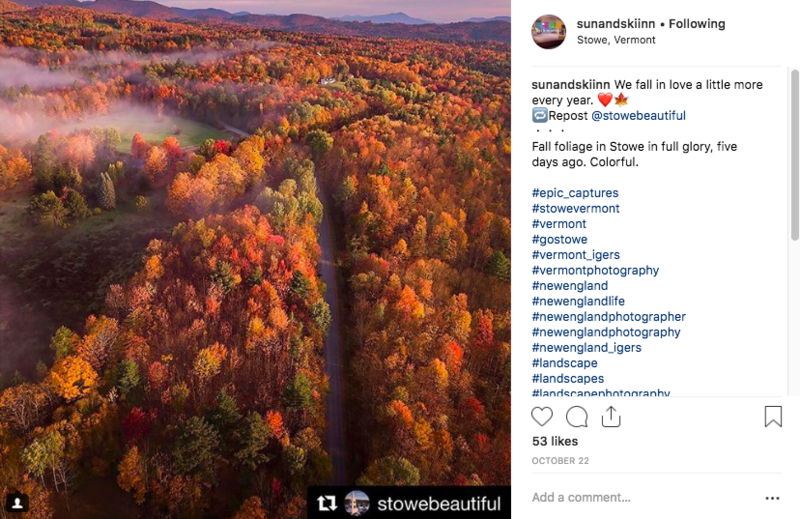 By reposting this image, Sun and Ski Inn can share the beauty of Vermont with their followers, while giving a shoutout to Stowe Beautiful and sharing the account with their audience. Regramming also helps generate more content quickly. You’ll get the most out of your Instagram account when posting multiple times a week, which can be difficult to keep up with sometimes. Reposts are a way to post engaging, relevant content efficiently. Yes, Instagram is limited to visual content, but that doesn’t mean you have to keep remaking the same post! Want to promote a special offer, or share a great review of your business? Or maybe you just want to share a great quote. Instagram is a visual platform, so posts have to take the form of photos or videos, but don’t fret! Although these types of posts are text-based, there are many ways you can post text in a visually-stimulating way. Online applications, like Canva and Adobe Spark, can be used to make these graphics. The best part, these applications will make your posts look professional and attractive for free. Go further than still images and try posting some videos. Again, the only limit is your creativity. Product reveals, tutorials, special events, or maybe just a video that made you smile- Instagram gives you the opportunity to connect with your target audience in a more personal way than traditional advertising, so post content that your followers will engage with and enjoy. Like reposting, having another user take over the company account will generate more content and keep your profile interesting. Look to the people around you. Having employees occasionally take over the account will give everyone in your organization an opportunity to engage with your followers. Your consumers will also get a more genuine look at the people within your organization, which will humanize your brand and build trust in potential leads. You can also network through guest posting. Look to your local community and consider your target audience. Find someone who will represent what your brand stands for and has a local influence. Instagram is a fun way to engage with your target audience while also providing valuable content and promoting your business. To get the most out of your account, don’t be afraid to get a little creative! Still not sure how to integrate Instagram into your marketing strategy? Check out our blog to learn How to Use Instagram.